Carrot cake is actually my favourite. We had cupcakes for our wedding and some just had to be carrot cake. But, I have never actually made carrot cake myself! So in my week off work I decided to find the best recipe to use up the leftover carrots from my vegbox. This one was titled the Best Ever Carrot Cake Cupcakes and I think she might be right. They are just so moist. I made them on Saturday and popped into town on the Sunday. As I was parking at work I decide to leave the team some cakes in the fridge for Monday and they were surprised at how well they had kept – still moist due to the pineapple and apple sauce in the batter! This recipe is adapted from Half Baked. In a large bowl, beat together eggs, oil, apple sauce, sugars, pineapple and 2 teaspoons vanilla. Mix in flour, baking soda, baking powder, salt, cinnamon, nutmeg and small pinch of ground cloves. Line a muffin tin with cupcake wrappers. Fill each liner 3/4 full. Bake in the preheated oven for 18-20 min. Let cupcakes cool completely. While cooling, prepare frosting. In a medium bowl, combine butter, cream cheese, icing sugar, vanilla and cinnamon. Add milk a tablespoon at a time, if needed to get a smooth consistency. Top with the toasted chopped pecans. 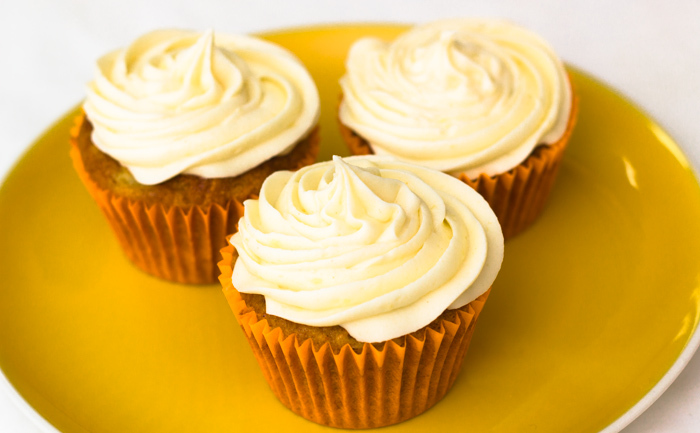 These carrot cakes are so easy to make and taste delicious. The frosting is just sweet enough and combined with the carrot cake tastes amazing. I believe they also converted a few people that said they didn’t like carrot cake! If you are a regular carrot cake baker don’t be put off by the crushed pineapple and apple sauce – they add so much depth to the recipe. I am trying to convert the measurements and I’m not quite sure what you did for the pinapple. I’m still working to convert them however if you know them that would be a great help. I just used a tin of crushed pineapple. I am not sure what measurements you are converting to but if you can use an 8oz can that would work perfectly. Are you ok with the conversions for the rest of the ingredients? Win a meet and greet with Mary Berry at Afternoon Tea!